Stage 12 of the Tour took riders over three different hors catégorie (HC) climbs which comprised the 175.5 Km route. After the neutral start, the stage began with a near immediate ascent of the Col de la Madeleine and was then followed by Col de la Croix de Fer, finally culminating in the storied 21 switchbacks that make up the Alpe D’Huez. 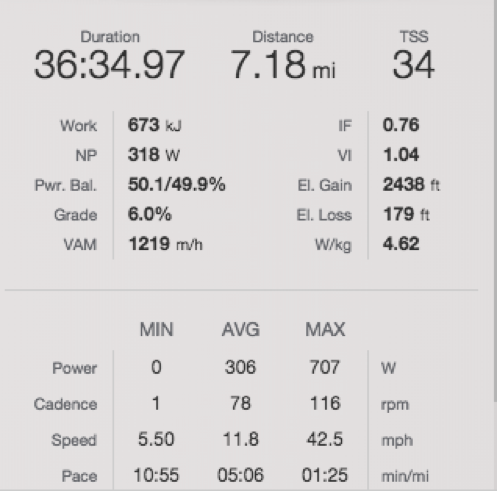 Ian Boswell of Team Katusha Alpecin shared his ride data with us so that we could perform a detailed post-ride analysis and get a sense for what it takes to ride in the high mountains of the Tour de France. Let’s dive deeper. The thing that makes this stage both exciting and interesting is that the Alpe D’Huez, arguably the most famous of all of the climbs in the Tour, comes at the end of this nearly 6-hour stage. It’s worth looking at the two major climbs before the final ascent to help set the stage for the classic Alpe. As the riders inched their way closer to the Col de la Madeleine, the field was no doubt getting antsy. This nervous energy shows in the initial minutes of the first HC climb of the day. 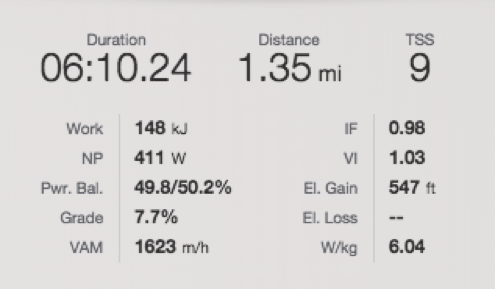 To maintain contact with the peloton Ian averaged 6.04 W/Kg, or 400 watts, for the first 6 minutes of the climb at a grade of over 7.5%. 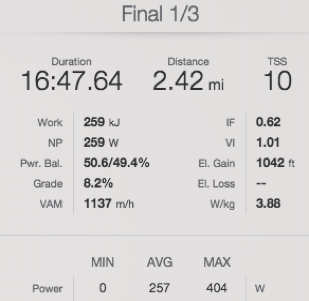 This was an effort very near to his FTP and no doubt a big match to burn after the relatively mellow lead up to the climb. After this big acceleration, the pace steadied somewhat and allowed Ian to climb for the next hour at a relatively comfortable 4.8 W/Kg. Now that the first climb jitters were out of their systems, and the long descent of Col de a Madeleine was behind them, they set their sights on the next HC climb of the day. Unlike the Alpe D’Huez which climbs steadily upward, the Col de la Croix de Fer is comprised of 3 distinct segments with small descents along the way. This requires a more tactical approach where efforts are doled out sparingly in an attempt to save enough for the finish. 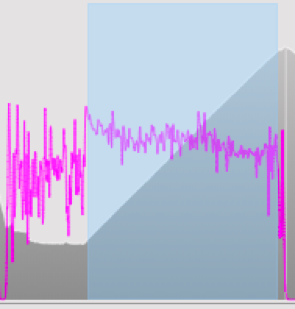 We can see three very distinct power profiles for these three unique sections of the climb. 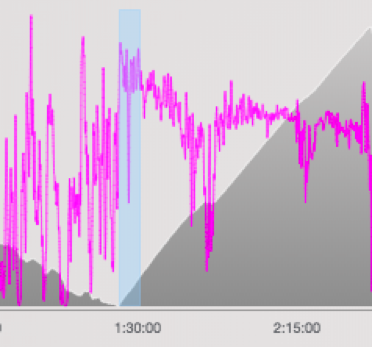 The 1st and 2nd segments are the steepest and required the most power output, requiring Ian to ride at between 300-350 watts for the first 35 minutes of the climb. Much like the first climb the pace and gradients relax somewhat to allow Ian to top out on the second climb well within his limits at around 70% of his FTP, or 4.35 W/Kg. This is almost certainly the climb that the entire field was thinking of all day. Regardless of position, every rider knew that they had to end with the relentless switchbacks of this historic climb. After the second major descent, riders rode the approximately 16K valley crossing before starting their final ascent of the day. While this wasn’t the most exciting part of the day, it was a chance to recover and practice smart tactics before the final push. Based on the power profile we can see a few things that make this segment worth mentioning. The first is the relatively high, by comparison, Variability Index (VI) of 1.06. This gives us some insight into what may have been more nervous energy leading up to the climb as the peloton jockeyed for position and standing. Specific to Ian we should also note the very low-Intensity Factor (IF) of .56 for this section. This provided a much-needed respite from the aggressive pace earlier in the stage. Although the valley floor was a chance to rest, it undoubtedly felt too short as the riders approached the final climb. At this point, the peloton had been racing for nearly 5 hours, nearly 3 of which had been climbing. 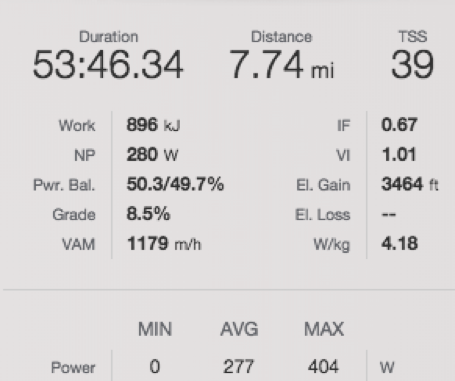 Ian had averaged between 70-92% of his FTP on every climb for the entire day while producing 5.5-6.0 W/Kg every time it was called for. The Alpe D’Huez was going to be as much mental as physical. One of the biggest physiological components of a stage like this one is the ability to resist fatigue. It’s not good enough to climb one of the mountains well, but riders need to be able to produce those efforts multiple times, while still having the legs for the stages to come. There are a few metrics that highlight Ian’s resistance to fatigue well. 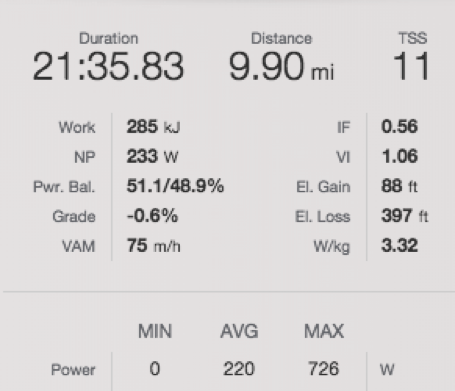 First is the fact that there’s only a 110-watt difference between the final 45 minutes of the 2nd climb and the entire duration of the Alpe D’Huez. That time period covers nearly 2 ½ hours of racing. 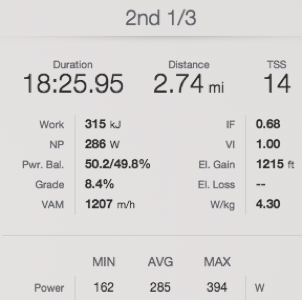 Next, he managed to average over 1150 VAM (meters per hour) on every climb of the day. Keep in mind that 1000 is the benchmark and considered exceptionally strong, so averaging 1150 VAM, and producing as high as 1650, shows a very high resistance to fatigue. Now let’s look at the climb itself. With a fragmented and dynamic front end of the race, most in the peloton made it their goal to simply not lose time in the overall GC standings. The controlled and managed pace of Ian’s highlights the strategy to ride strong while saving some for the rest of the high mountain stages, as well as provide support to team leader Ilnur Zakarin. 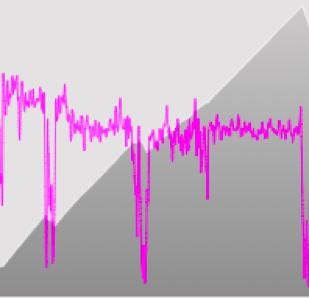 His average power was 278 for the duration of the climb with a Normalized Power (NP) of 280. 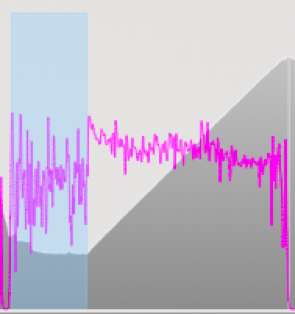 The close relationship between NP and average power highlights the overall pacing strategy of both the peloton and Ian. They were all conscious of the effort it takes on the climbs and careful not to burn any unnecessary matches knowing that there are plenty more big days to come. These efforts become more like time trials than sprints for the summit. We can further break down the climb by looking at the ride in segments. If we break Ian’s performance down into thirds we can get an even better sense of his performance and natural strengths. From the start of the Alpe to the top, it took Ian and the rest of the peloton just under 55 minutes. Comparing the start of his climb to the final minutes, we see just an 11% decline in average power and just shy of 4 W/Kg. This is a relatively subtle decrease given the physicality of the stage and the effort it took to get through the first 5 hours of racing, once again highlighting Ian’s superior fatigue resistance. Stage 12 was a highly anticipated day in the Tour de France. Regardless of whether a given rider was on the sharp end of the field, or simply trying to make it through, it was a dynamic and physically demanding course. 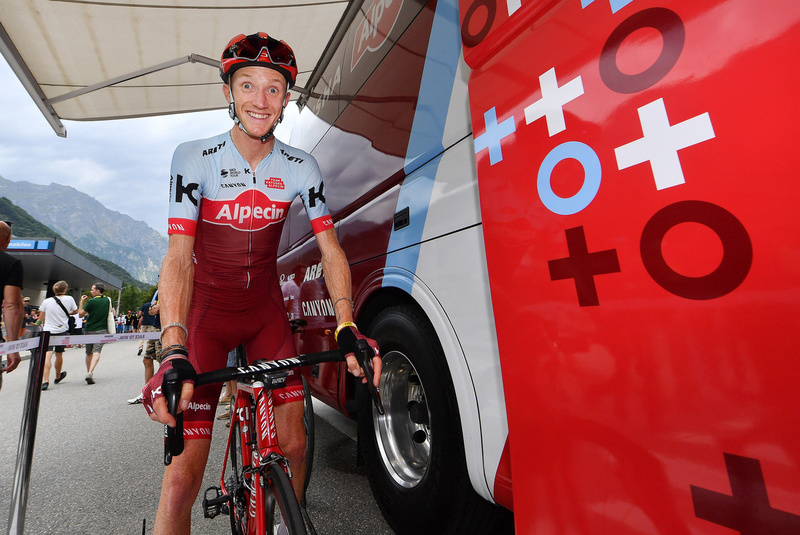 Ian Boswell’s data from Team Katusha Alpecin helps us gain some insight into the real demands of riding in the peloton of the Tour. Team Katusha Alpecin hopes to put some of their riders in the running for the GC, and with performances and stages like this one, they are sure to make things interesting.